The city of Rochester is the county seat of Olmsted County and, with a population of over 110,000, is the third-largest city in Minnesota. Home of the famous Mayo Clinic, Rochester was named the 19th safest city in the US in 2017. Rochester’s accounts payable department processes about 2,800 invoices a month, which arrive by mail or email. The city uses JD Edwards EnterpriseOne (JDE) for financials. Before the process was digitally transformed, processing invoices was tedious work. The employee who received the invoice would pass it on to the accounts payable liaison for coding. After it was coded, the invoice was manually routed to an approver who would either stamp or sign it to signify approval. The invoice was finally given back to the original employee, who scanned it into Laserfiche and manually entered it into JDE. This process was paper heavy and inefficient. There were massive amounts of invoices and receipts shuffling across departments and different physical locations. As there was no actual records retention in place, all records were stored in cabinets and never disposed of. This resulted in an excess of wasted space. This entire process has been transformed with Laserfiche Forms, an integration with JDE and the Laserfiche Records Management Edition. Department liaisons now save invoices to the Laserfiche repository as soon as they are received. If an invoice needs additional approval, the department liaison uploads it to a Laserfiche form and selects the name of the appropriate approver from a dropdown list. Once the form is submitted, Laserfiche Forms automatically routes it to the appropriate individuals for approval. The approver can then open the task assigned to him and review the invoice. 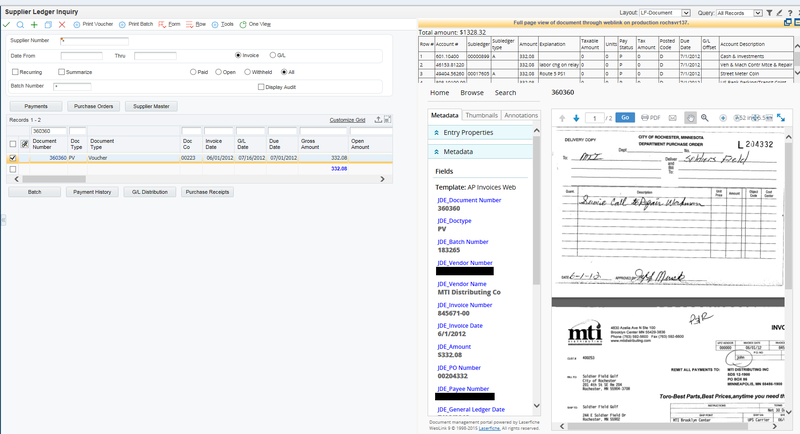 To make reviewing the invoice easier, the document is embedded in the form. Once approved, Forms automatically notifies the department liaison via email. Once the invoice is approved, the accounts payable liaison keys the data into JDE. Laserfiche Connector is used to add the associated JDE document number into the invoice’s metadata to link it to the entry in JDE. Workflow then routes these documents to the appropriate Laserfiche folder based on document type. After each approval step, Workflow adds a stamp annotation to the top of the page with the name of the approver and the date. If an auditor pulls up the document later, he can see the full audit trail without having to go into another system. The document life cycle is maintained through Workflow and the Records Management module. Rochester integrated JDE with Laserfiche. 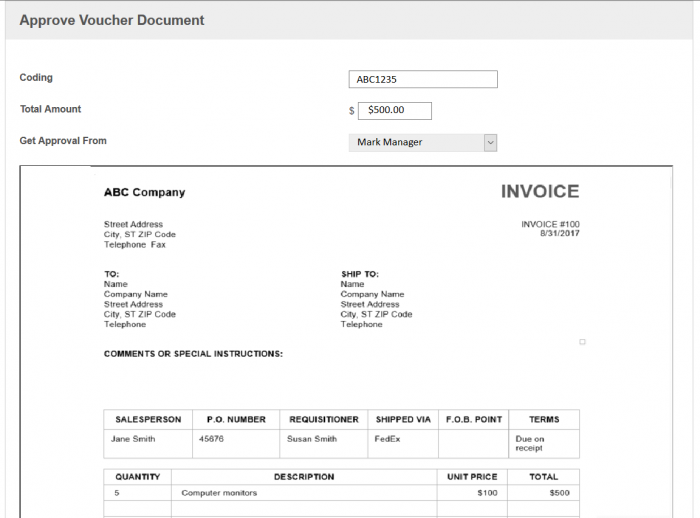 Vouchers, journal entries, and invoices are entered into JDE and the source material is stored in Laserfiche. The documents are indexed by the corresponding JDE document number and type. 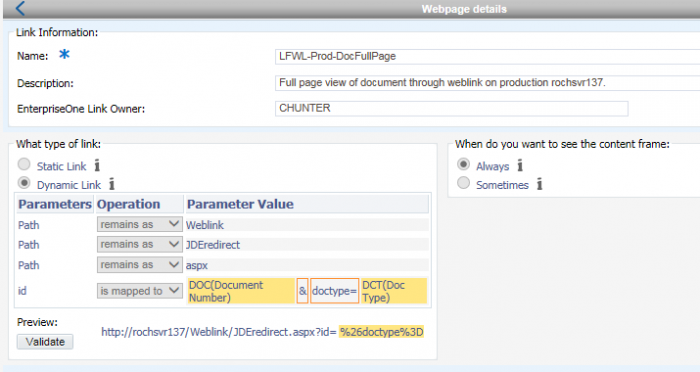 They are then displayed back to users from within the JDE application via Laserfiche WebLink dynamic URLs. Using direct writes into the JDE SQL database. 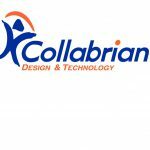 The JD Edwards EnterpriseOne Tools 9.1.5 introduced a tool called Café One. Café One provides the ability to customize JDE layouts and utilize dynamic URLs populated by information currently on the JDE screen. The city uses a dynamic Laserfiche WebLink URL to populate a link based on the JDE document number selected. As the user selects or navigates to another row, the right pane automatically updates with the corresponding Laserfiche document. Rochester’s Café One setup routes the user to a custom page which checks to see if the document type being requested is standard voucher. If so, it shows the line item details in a frame on top of the WebLink document. 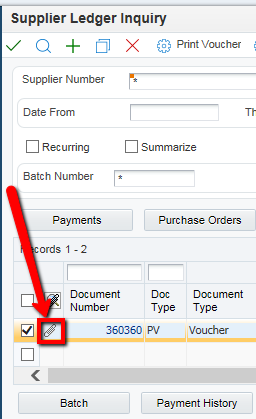 If the document is an invoice, it shows only the document and not the line item detail. This could easily be configured to link directly to WebLink. The Café One configuration is shown in the screenshot below. JDEredirect.aspx is a very small custom app which uses the document type and document number to determine if it should send the user to a modified version of WebLink which will display the line item detail, or a regular WebLink page. Department heads can approve the invoice from anywhere and are no longer restricted to their desk or computer. Auditors can see the document’s audit trail by looking at the annotations instead of having to go to a separate system. Invoices are paid promptly as they are processed more quickly. Retention is set automatically, keeping documents from being held indefinitely.